The Chimpanzee Complex is a science fiction documentary about a psychiatric institution for traumatized chimpanzees. The main characters in THE CHIPMANZEE COMPLEX are traumatized chimpanzees. 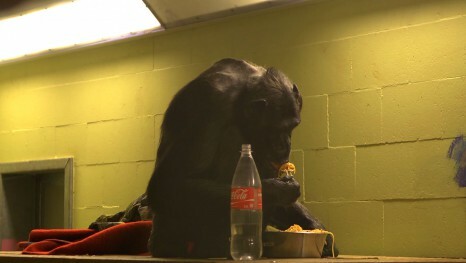 After years in solitary captivity, the traumatized chimpansees in a Dutch rescue center must learn to live with members of their own species again. The caretakers who accompany this process, work towards a paradoxical goal: as people they try to let the animals be animals again. Emotional confrontations and ethical issues emphasize the ambiguous relationship between man and primate. Is it possible to think beyond the boundaries of our human perspective when trying to understand another species? Financial support: Dutch Cultural Media Fund, CoBO, Dutch Filmfund, Bundesamt für Kultur, Zürcher Filmstiftung. Length: 55' and 75' minutes. THE CHIMPANZEE COMPLEX is a multi platform documentary project that includes a documentary film, a game and a social media campaign with unique content (Dutch language only). THE CHIMPANZEE COMPLEX has been screened at the Sheffield International Documentary Film Festival (Sheffield, June 5-10 2015). THE CHIMPANZEE COMPLEX has been screened at the Docaviv International Documentary Film Festival (Tel Aviv, May 7-16 2015). THE CHIMPANZEE COMPLEX has been screened at Thessaloniki International Documentary Film Festival (March 13-22, 2015). Director Marc Schmidt is attending several screenings. Swiss première of THE CHIMPANZEE COMPLEX at the Solothurner Film Days (January 22-29th 2015).